There's an old phrase “hearth and home” that doesn't get used much any more, because real fires are a rarity nowadays. But "hearth and home” is still a powerful idea - warmth and shelter are at the centre of most families, it is to be hoped. Today's workshops homed in on this part of life. We brought in the kinds of little ceramic figures that people used to decorate their mantlepieces and these became a stepping stone towards talking about the home itself. Both morning and afternoon sessions were full of affectionate warmth, mixed with some sadness. In the afternoon another of the pieces carried a similar double-edge. 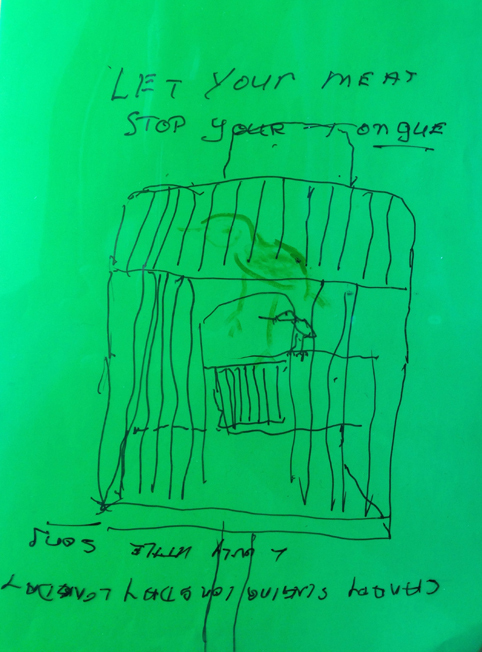 B's picture of a canary in a cage is told to be quiet and eat its dinner – “Let your meat stop your tongue.” The answering phrase “Canary sang a lovely little song day long day long” is upside-down. Hidden under the layers of acetate drawing, caged by them, is a delicate drawing of a yellow canary. Again, B's relationship with her mother was a conflicted one. Draw your childhood mantle-piece onto a piece of acetate paper – mum's knick-knacks, a clock, heirlooms, prized possessions. Put another layer of acetate on top. Write one of your parents' favourite sayings onto this layer, responding to the shape of the drawing. Phrases that might come to mind: 'Cleanliness is next to godliness', 'You are a nuisance', 'Waste not want not' etc. 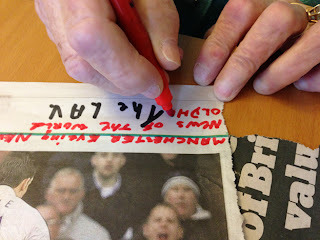 Add other layers of drawing/writing on more acetate as desired. Finally, draw a fire on a piece of white paper in approximately the right place to fit into your mantle-piece drawing. Don't worry if the fire overspills, or doesn't quite fit – it's the IDEA of warmth we're after. 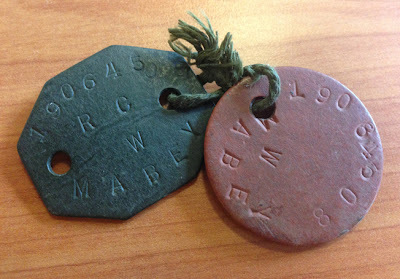 What were your family's prized possessions? What were you taught about niceness, neat appearance and good manners? What do your family's ornaments 'say'. Are they showy, delicate, brassy, ugly, nostalgic, sentimental...? 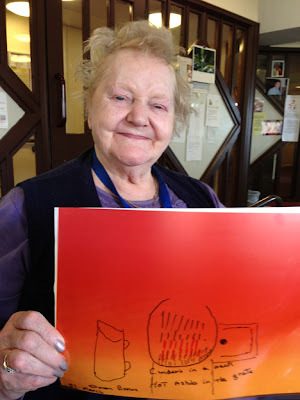 We're working in partnership with Gallery Oldham developing the use of memory boxes for reminiscence amongst older people, including people with a dementia diagnosis. Let's not pussyfoot, dementia can bring terror and anger and bitterness among many other calling cards. The work we're doing with memory isn't a panacea for those things, we're not doctors, but we are a distraction. Rather than allowing participants in one of our groups to enter a negative mindset, we can help to short-circuit the blues and the fury – sometimes. 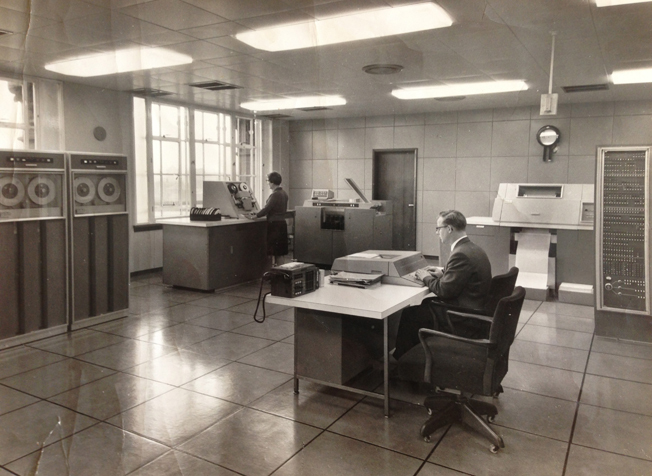 This day in Oldham gives examples of both situations and how we dealt with them. Thematically we were dealing with the subject of pubs and the social life around them, but we were also dealing with participants' very particular needs. 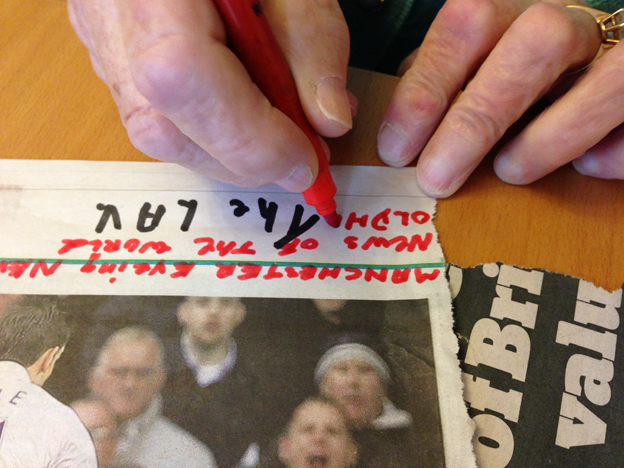 Our first session regularly includes two people who have a dementia diagnosis. One of them is perfectly aware of this and will 'own' the illness, talk about it, and try to negotiate around it. The other person is in denial of what's happening, has a tendency towards anger. The two are chalk and cheese as they say and often fight. 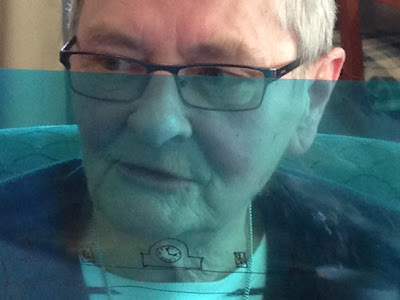 We only recently found out about the unspoken dementia - and it therefore took us some time to realise that there's possibly an underlying issue. Dementia is the elephant in the room and like any unresolved issue it causes tension. It's a tricky situation and one that we've so far defused by using the creative activities and conversation. We've also had after-workshop discussions with all concerned. However it's possible that we'll have to ask the aggressor to leave the group. Our duty is always to make sure that we run a 'safe place to play' and occasionally this needs reinforcing with firmness. But for now distraction is working fine. 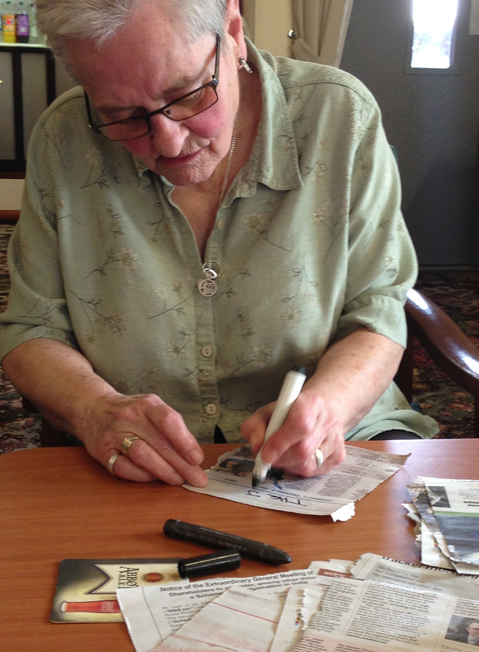 The other session is with a group of six to eight people, most with a diagnosis of dementia/s, at varying stages. This group have generally been a very 'up' session for us. Although there are tremendous difficulties for some participants to overcome, there are also two key advantages - acceptance and very importantly humour. Laughing can't solve complex problems in itself, but it helps to de-stress a situation and in doing so we all move on. These sessions use a higher mix of game-playing than we'd usually employ (singing, playing marbles, etc.) but the play also quite evidently brings delight. Interestingly, here is also the venue where the deepest political discussion takes place – one of the participants is very hard left, another is a war refugee and others are ex-mill-workers with no illusions about their position in society. This isn't a rosy-glow gathering, but it is a fascinating, funny, damn good time. The game of marbles we played there brought particular delight. It was a small riot. Marble skills of 80-plus years were employed. Particular hilarity ensued when the staff had to dodge the little glass balls of peril. There was perhaps an element of revenge in the joke, but most of all laughter that was shared equitably. 1. Look at some examples of beer mats, bottle tops, etc. 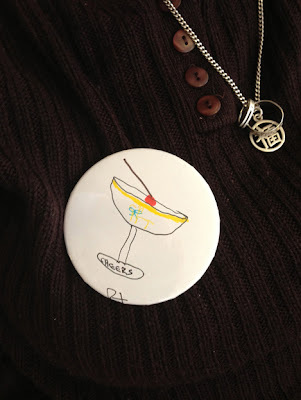 Invite participants to draw their own bottle top or favourite drink. Perhaps the drink might incorporate their own name and a famous slogan (eg. Alfred, probably the best grandpa in the world. Gladys is good for you, etc.) Make the composition circular and it can become a badge. 2. Word association game. This is an excellent way of getting a discussion going, or stimulate ideas for writing. Our discussion this time was themed around pubs and the word used are listed below. We often use pairs of opposites so that the game is more intriguing. We're working with Gallery Oldham to expand the possibilities of memory boxes in reminiscence, devising creative exercises. We've been using lateral thinking methods for our workshops. Reminiscence tends to work along certain lines and themes with the outcomes reduced to safe bits of nostalgia. We've found that bringing off-the-wall thinking to the workshops keeps things interesting for us and for the participants. It's also a way for people to express their opinions, make their mark. 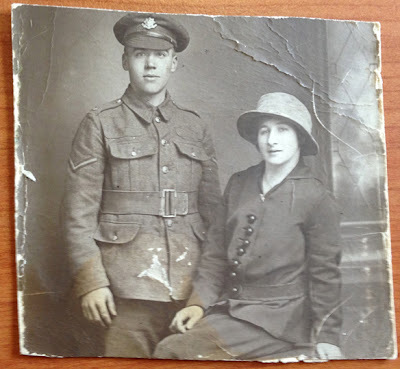 Lives and history don't necessarily fit into neat little boxes. What we're trying to do is find the personal, the individual stories that weave into a broader tale. That is what makes for good art an it is also what makes for insightful history too – the retelling of the familiar, the finding of new meanings. Much of our inspiration comes from 'concrete poems', sometimes called shape poems, and we used that approach today. 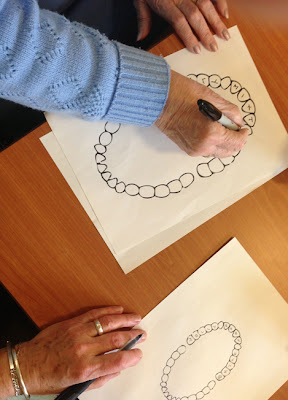 Lois created some templates based on dentists' teeth charts. 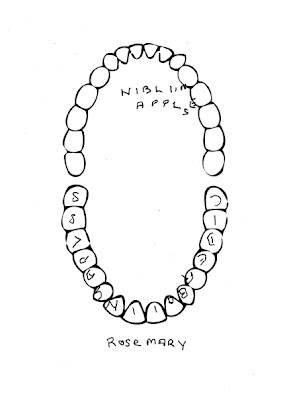 Participants wrote a letter into each tooth, spelling out first the name of a favourite sweet and then a dentist-related word, alternating them until all the teeth were filled. It's a straightforward word game, a little like doing a crossword. 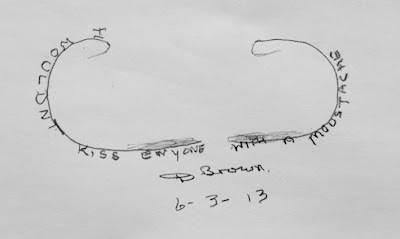 To our delight, the afternoon group – many of whom have dementias – enjoyed this exercise greatly. Some people picked words that linked together to tell a story, others were content to be more random. Make a simple templates based on dentists' teeth charts (see above). 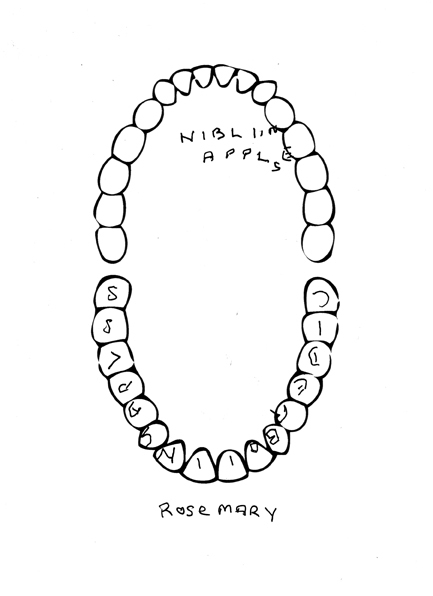 Participants write a letter into each tooth, spelling out first the name of a favourite sweet and then a dentist-related word, alternating them until all the teeth are 'filled'. It's a word game, a little like doing a crossword, which can bring poetic results. 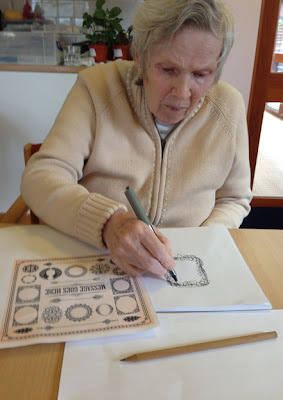 We're coming toward the end of Spaghetti Maze, our project making life stories with people who have a dementia diagnosis. We've had a break from the project to assess the material and on returning to the Pinfold Lane Centre in Whitefield, we were made very welcome by the staff. Interestingly, although our participant groups have memory loss problems they all remembered us too – despite a 3 month break – which suggests that we've impacted on them quite deeply. Hopefully, it also suggests that we are doing something right and the bonds we've formed are strong. Both sessions were very heavily planned because we're tying up loose ends, bringing our work with this particular set of people to a close. We wanted to fill in any gaps that we might have left in the life stories and so had very focussed and time-aware sessions. We're also thinking about taking this work forward - how we can develop this further into a large-scale life story book that we will publish. We have spent over a decade working with many, many groups but the connecting thread has always been the telling of lives. 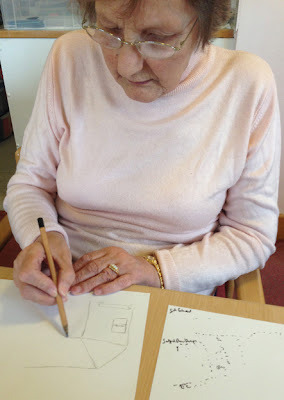 Now we're turning these skills and techniques into a how-to guide for others to use, particularly people with a dementia diagnosis and those around them – carers, relatives. Today, Lois brought two drawing exercises; a particular success was the suggestion that people draw the home of their childhood. Often people are reluctant to pick up a pen and draw. It's a big leap of faith to trust that they won't be mocked, by us, their peers, or (most devastatingly themselves, seeing oneself produce drawings that appear child-like can lead to a sense of being diminished). Actually, today there were no complaints. 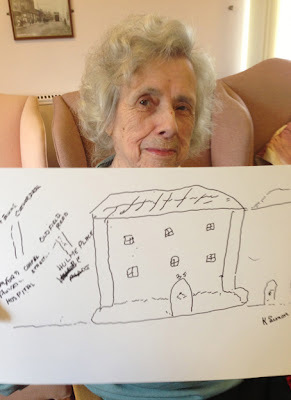 Drawing a house is one of the very first things we learn to do at school; it is iconic and because of that people didn't seem to mind having a go. Perhaps because the point of a drawing like this is that it's not technically perfect. Like a picture of a smiley face, it's the spirit of the thing that counts. We're also building a repertoire of new writing exercises. These have to tread a line between being informative and something more wayward, which allows room for the eccentricity and tangential thinking that makes an individual. We tried making little charts of family members, name, rank, and other details and putting them into a grid. Dependent on how this is filled in and read out, this can be a 'straight' information chart, or a more elusive, poetic piece. 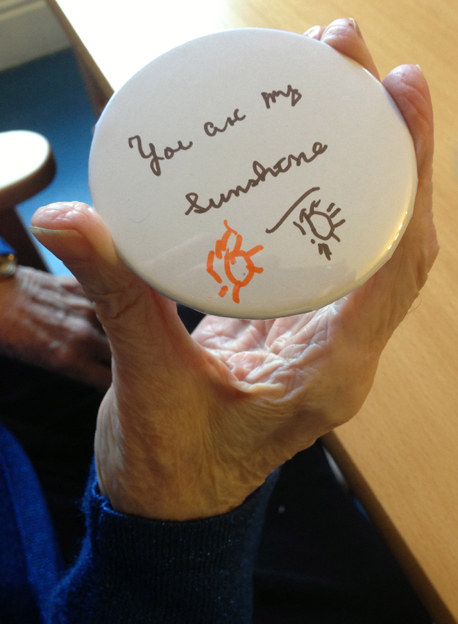 The Pinfold Lane Centre is a dementia daycare centre, but it is also a remarkably happy, safe gathering place for people people who sometimes struggle with the world. It's a haven, a house of memories, a place of forgetting. Every time we make our goodbyes, I realise that I've been uplinfted by my day there. It's the biggest compliment that I can think of, to the staff there, that from much misery and confusion they bring something joyful.